Panasonic Toyota Racing unveiled its new TF107 challenger in Cologne on Friday 12 January, prior to embarking on an intensive test programme in preparation for the first Grand Prix of the season in Australia on 18 March. Toyota is the only one of the 11 F1 teams to go into the new season with the same engine, the same tyre partner, and the same two race drivers. That unique degree of continuity will enable the team to hit the ground running and build on the experience gained over recent seasons. Toyota has ambitious goals in Formula 1: "Our fundamental challenge this year is to get the first victory," says Chairman and Team Principal Tsutomu Tomita. The major technical changes of the TF107 compared to the Toyota TF106B are the engine and gearbox that have moved forward and the front of the monocoque is higher but slightly thinner. Most of these changes are driven by the aerodynamic development of the car. The most noticable might be the absence of the bulges on top of the nose cone. Earlier, in the TF106B those were developed to improve the suspension geometry. In general, the new Toyota looks thinner at the back and sports brand new wings that look more up-to-date than the boxy model wings the team has been using with its 2006 contenders. 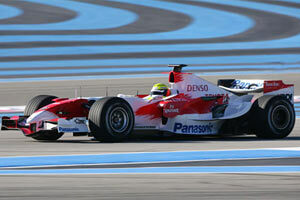 The spoon curve of the initial front wing seen at the launch actually resembles that of the Honda RA106 at some races. As is usual with early launches in F1, the team already reckons the car will be fitted with a completely new aerodynamic package before the first race while a second big upgrade will be ready after a few events. Front suspension: Carbon fibre double wishbone arrangement, with carbon fibre trackrod and pushrod. Rear suspension: Carbon fibre double wishbone arrangement, with carbon fibre toe link and pushrod. Revolutions: Maximum 19,000rpm, as required by FIA rules.